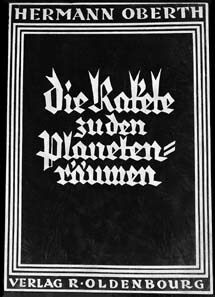 The cover of Oberth's celebrated work Die Rakete zu den Planetenräumen (The Rocket into Interplanetary Space). Hermann Oberth was a Romanian-German space pioneer, born in the Transylvanian town of Hermannstadt. Along with Konstantin Tsiolkovsky and Robert Goddard, he is considered to be one of the founding fathers of modern rocketry and astronautics. Oberth's interest was sparked at the age of 11 by Jules Verne's From The Earth To The Moon, a book that he later recalled he read "at least five or six times and, finally, knew by heart." By the age of 14, he had already envisioned a "recoil rocket" that could propel itself through a vacuum by expelling exhaust gases from a liquid fuel. He realized early on, too, that staging was the key to accelerating rockets to high speed. In 1912, Oberth enrolled in the University of Munich to study medicine and later served with a medical unit in World War I. During the war years, however, he realized that his future lay in a different direction and upon returning to the University of Munich, he took up physics. In 1922, his doctoral thesis, in which he described a liquid-propellant rocket, was rejected as being too unorthodox. However, Oberth published it privately the following year as a 92-page pamphlet entitled Die Rakete zu den Planetenräumen1 (The Rocket into Interplanetary Space) which set forth the basic principles of spaceflight. A much-expanded version, entitled Ways to Spaceflight, appeared in 1929 to international acclaim and served to inspire many subsequent spaceflight pioneers. 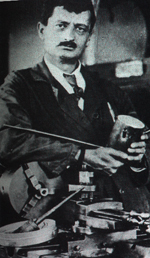 Unlike Robert Goddard, Oberth was not slow in seeking publicity for his work. In the same year his enlarged treatise went on his sale, he became technical advisor for the film Frau Im Mond (Woman in the Moon) and was commissioned to build a rocket that would be sent up as a publicity stunt. Aided by the young Werner von Braun, Oberth managed to build and statically test a small rocket engine – a risky laboratory exercise in which he lost the sight in his left eye. But when it became clear that the rocket would not be ready to launch in time for the movie's release, the project was abandoned and, shortly after, Oberth returned to teaching in Transylvania. 1. Oberth, Hermann. Die Rakete zu den Planetenräumen (The Rocket Into Interplanetary Space). Munich: R. Oldenbourg (1923). 2. Rauschenbach, Boris V. Hermann Oberth: The Father of Spaceflight. Clarence, New York: West-Art (1994).